The remarkable cities of Stockholm, Oslo, Bergen and Copenhagen will come alive with history, Viking legends, Hans Christian Andersen and The Little Mermaid. 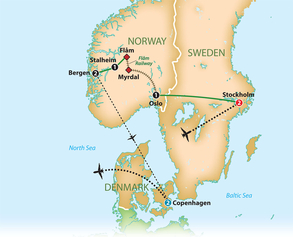 Add the unbelievable natural beauty of the Scandinavian countries and you’ll have the holiday of a lifetime. Today you’ll depart the USA on your overnight flight to Stockholm, Sweden. After breakfast, enjoy a Stockholm city tour. Once home of the Vikings, today’s Sweden is a captivating mix of old and new. Stockholm, Sweden’s capital, is the very epitome of a vibrant cosmopolitan center, a city alive with world-class art museums, cutting-edge fashion boutiques and sizzling night life. Remarkable architecture abounds, exemplified in the dazzling City Hall, site of the Nobel Prize reception, with its glittering gold walls and stunning colored-glass mosaics. But even in this thrilling center of culture, you’ll find traces of Sweden’s fabled past.